The visual journalism program at Brooks Institute trains students in the areas of multimedia journalism and documentary filmmaking. My teaching duties include a range of courses across the curriculum, including photojournalism, newswriting, audio storytelling, web design, publication design, ethics, portfolio development, documentary projects, independent study and internships. Additional responsibilities include curriculum development, professional development, program assessment, school-wide committee work and student advising. Developed website and curriculum for an online publication course, BrooksInSight.com. Awarded 2008 Brooks Faculty of the Year. Nominated for the 2005 Career Education Corporation Teacher of the Year. Organized student-produced multimedia expeditions to Argentina in 2005, China in 2006 and Ireland in 2007. Supervised production of multimedia video projects, websites, books and print gallery shows. Established Brooks NPPA in 2002, an official student chapter of the National Press Photographers Association. Served as faculty advisor from 2002-2005. Graduate Thesis Advisor: Served on a number of graduate thesis advisory committees for students pursuing a Master of Science in Photography. Advanced Topics / Internship: Supervise students with off campus internship opportunities. Internships have included small daily newspapers, international magazines and websites. Responsible for monitoring student progress on a weekly basis and regular communication with the internship provider. Advanced Topics / Independent Study: Supervise students who choose to work on an independent study in an area of their interest. Portfolio & Ethics: Work with upper division students in this capstone class to fine tune their market-specific portfolio and other collateral materials needed for entering the job market. Students in this course also exam ethical issues related to visual journalism. International Documentary I: Planned and traveled with students to an international destination, spending five weeks photographing, capturing audio and shooting video for use in multimedia projects. This is a competitive course in that student apply with a portolio, references and an interview with the instructor. Students who are accepted into the class then work with instructor for six months prior to travel to establish story ideas, make contacts, work out travel logistics and fundraise for post-production needs. International expeditions led by Gosen include: Buenos Aires, Argentina in 2005, the Sichuan Province of China in 2006 and Ireland in 2007.
International Documentary II: Supervised students in various group projects using pictures, audio and video captured during the International Documentary I course. Projects included creating a group multimedia documentary using Final Cut Pro, working with a composer to create an original score, recording narration and live musicians for the multimedia piece, producing a DVD using DVD Studio Pro, publishing a book using Adobe In-Design, creating a website using Dreamweaver and WordPress, and printing images with Epson printers for a photographic gallery show. Book: Ireland: A Brooks Institute Documentary, ISBN 0-9718622-5-7. DVD Screening: Lobero Theatre, Santa Barbara, CA; Brooks Institute, Ventura, CA. Gallery Exhibits: Visions Gallery, Ventura, CA; Gallery 27, Santa Barbara, CA. Book: China: A Will to Rise, ISBN 0-9718622-4-9. Awards: First Place Documentary Film award at the 22nd Ft. Lauderdale International Film Festival Collegiate Competition. Award of Excellence at The Accolade Film Awards competition. Featured in 2008 Cinequest Film Festival, San Jose, CA. Book: Argentina: Con Fuerza, ISBN 0-9718622-3-0. Gallery Exhibits: Brooks Institute, Ventura, CA; Gallery 27, Santa Barbara, CA. Picture Editing & Publication Design: The emphasis in this course is on the presentation of pictures in a final form. Students experience a hands-on production of a magazine using photos and stories they created during the class. Students in the class take on the role of content producers as well as the content editors. Editorial management, teamwork, decision making, magazine design and production cycles are incorporated into the class. Online Publication: In this course students gain experience producing and editing Brooks Insight, which is a web-based, visually driven online magazine. Students work as an editorial team to create, commission and edit stories and projects for publication. Together with their editorial colleagues, students organize and execute the photography, multimedia, audio and text requirements of the publication. The editorial process is covered from beginning to end, from story planning to the final product. Leadership, teamwork, production schedules and ethical considerations are factored into the planning and editing processes. Journalism II (feature writing): An advanced journalism course focused on researching, reporting and writing features and commentaries for various print, and web-based electronic media. The course includes information gathering, interviewing, identifying the various types of feature story, the structure and style of news features, profiles, investigative and enterprise stories, reviews, opeds, columns and the personal essay. The course focuses on active, efficient, accurate and colorful writing, with adherence to professional standards of journalistic ethics and media law. Visual Journalism III: Students refine their multimedia journalism skills through coverage in the community with an emphasis on localizing national and global issues. Students use all of their multimedia skills – audio, digital photography, video, writing, web development – to tell complete stories. The Picture Story: Students work in depth on several projects during the course. The approach follows the classic photojournalism picture story, which usually focuses on one individual and tells their story at length. Part of the emphasis in the class is pursuing stories of social relevance. Students produce still image projects and multimedia projects. Web for Visual Journalists: This course introduces students to the practical applications visual journalists use for creating and maintaining an online presence. Students construct websites using webpage production tools, basic HTML and CSS. Development of logical and efficient site structure, workflow, proper file formats, and design considerations are covered. Students also analyze and incorporate content management systems, such as blogs, archives and social networking tools used by visual journalists and media outlets for reporting news and generating site traffic. Visual Journalism II: This course provides an overview of current photojournalism trends and practices in the U.S., as well as, abroad. The fundamental principles of making the full range of “news-worthy” photographs – from feature photos to hard news – are covered in detail. The importance of the still photograph as a conveyor of information, and the power of the still photograph as an influence on public opinion in today’s print media, is woven throughout the course. Ethical considerations in photographing current events (local, national and international), freedom of the press, and the public’s right to know are also major topics addressed during the session. Journalism 1 (newswriting): An introductory journalism newswriting course that emphasizes fundamental reporting skills utilized by news-gathering media outlets. The course covers methods for gathering and reporting news, assessing news value, story research, story structure, source credibility and news judgment. All written material adheres to Associated Press style. Audio Documentary: The course provides an introductory understanding of audio as a medium of communication in the storytelling process. Students build on audio gathering and production skills as a stand-alone storytelling tool and as a way to enhance visual storytelling. 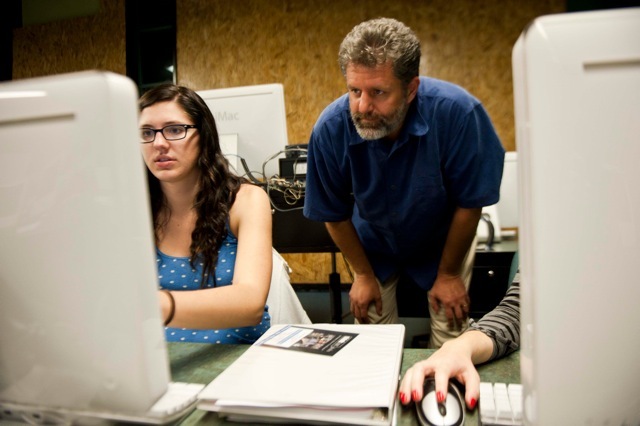 Students examine tools and applications used for audio in mass media and then practice techniques and skills associated with producing audio material in a journalistic environment. Lighting for Visual Journalists: A hands-on introduction to lighting for visual journalism students that explores the use of single and multiple light sources to enhance visual storytelling. Visual Journalism I: Students gain an understanding of digital still photography, camera functions, exposure control and storytelling techniques used by visual journalists. Students also learn how to establish an efficient workflow and write Associated Press style captions. Implemented the school’s transition from a wet darkroom to a digital darkroom in the Fall of 1996. Taught nine courses of photojournalism while working on a master’s degree. The course introduced basic photography to students and progressed to a hands-on understanding of digital imaging using Adobe Photoshop software. Students studied ethics, copyright and privacy laws while photographing self-generated news, feature and sports assignments, as well as portraits, photo stories and photo illustrations.